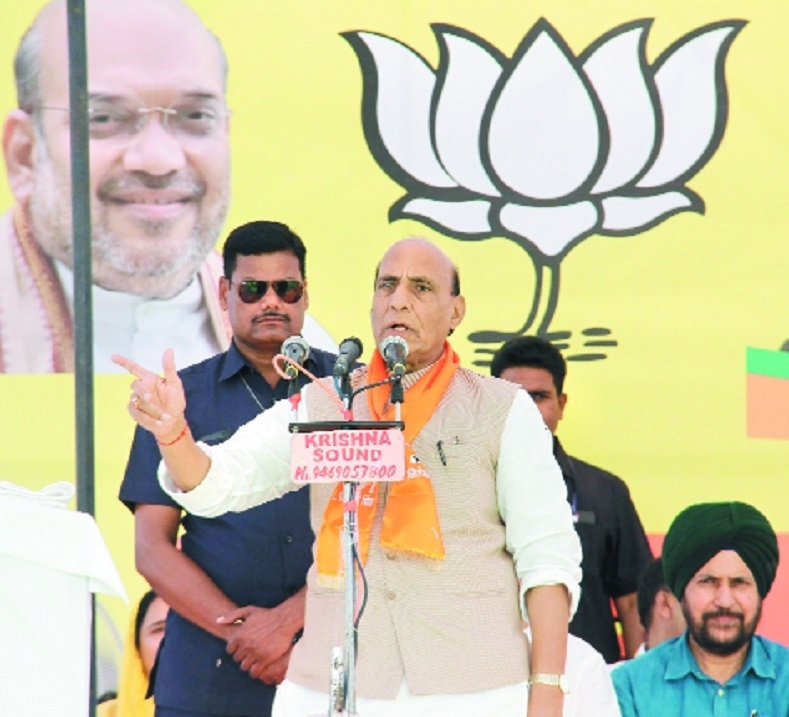 UNION Home Minister Rajnath Singh on Monday said that there will be no option with the Government other than abolishing Articles 370 and 35A related to special status to Jammu and Kashmir in the Constitution if there is a demand for a separate Prime Minister for the terrorism-affected State. His reaction came a week after National Conference leader Omar Abdullah had said that his party will strive hard for restoring the autonomy of Jammu and Kashmir that could include having a ‘Sadar-e-Riyasat’ (President) and ‘Wazir-e-Azam’ (Prime Minister). Addressing a BJP election rally here, Rajnath Singh asked the Congress to clarify its stand whether or not it supports the demand and said “such things” must be stopped. “Someone who has been Chief Minister for a long time has said that there should be a Prime Minister in Jammu and Kashmir. If someone talks like that, we will have no option other than abolishing Article 370 and Article 35A,” the minister said. Singh said Congress must make it clear whether it accepts that country should have two PMs. Such things can not go on and on. It has to be stopped,” he said On terrorism, the Home Minister said a befitting reply would be given to those who take up arms. “If someone takes up arms, we can go to whatever extent required to give them a befitting reply,” Singh said. He said the country is now in the “strong hands” of Prime Minister Narendra Modi. The Home Minister said the Central Government was ready for talks but those who are raising the Kashmir issue were not interested in any dialogue. Singh said considering the future of the children of Jammu and Kashmir, “we have forgiven 8,000 first time stone pelters but some people continue to instigate the stone pelters”. “These are the biggest criminals,” he said. The Home Minister said that Jammu and Kashmir has not been ruled by “outsiders” but by political parties like NC, PDP or Congress for long.